Let’s Do Lunch at the Shuk Market! 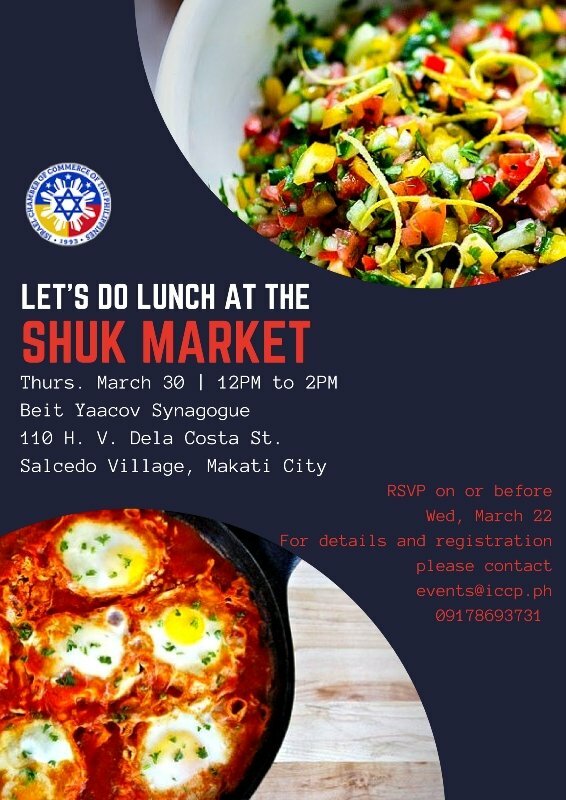 Experience great flavors at the Shuk Market at the Beit Yaacov Synagogue in Makati City. It's also a good time to meet with ICCP members and the local Jewish community. Forging new friendships is always better with good food! Limited seats available (payment will be on your own account, prices may vary depending on the menu). RSVP on or before Wednesday, March 22. (Please advise the secretariat for guest list and security purposes). Email: [email protected] or contact 856-3786 local 129 or 0917- 8693731.